Dallas, TX based Neo-Metal Band PHOENIX RISING has released the official music video for their single, "Do You Know". The band, who received the “Best New Artist” and "Best Metal Band" awards at the MXD MAG Rock and Metal Awards 2018 on July 21st, were formed just 7 months ago and have released 3 additional videos as well as a comic book tied to the track and video "If I Say No" that culminated with the release of the debut EP, Ignite, on July 29th. Watch the video for "Do You Know" on KNAC.COM HERE. Like setting fire to gas, the newly formed group had written an album's worth of material in one month, and the search for producers began. This search led PHOENIX RISING to Tyler Smyth; however Smyth was on tour six hours away in San Antonio . With no way to get in touch with Smyth, Kent went down to San Antonio with a pillow and a sleeping bag, on a mission to maneuver himself backstage, and persuade Smyth to listen to the demos, hoping that after hearing the music, Smyth would be driven to work with the band. 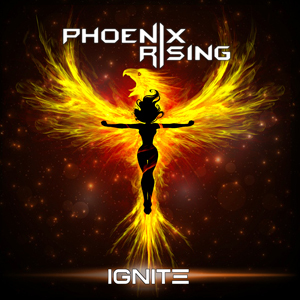 Mission Complete, Smyth agreed to work with PHOENIX RISING in LA and shortly thereafter, the band flew out to record their debut album From the Ashes.